Welcome to our Automatic Gate page.We can provide various types of Automatic Gates in Hyderabad. You can design your own gate or we can do it for you, whether you want them made from Steel, Aluminium or Wood we can provide a comprehensive range of samples enabling you to make the right choice.We are the leading suppliers of Gate Motors in Hyderabad. 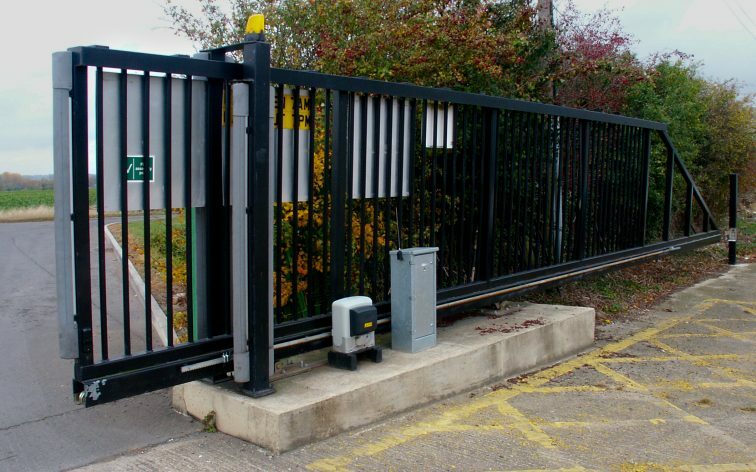 Automatic electric gates are an essential component of an integrated security and access control system where vehicular and pedestrian access need to be controlled. Haritha Technologies provides a complete automatic electric gates service in London and beyond, including design, fabrication, installation and automation. We can integrate your gates with a door entry system, access control system or biometric access system. We also provide electric gate repairs, service and maintenance. We have our own dedicated security gate automation and fabrication workshop. We can provide steel, aluminium and wooden gates and use innovative, high quality Roger Technology, BFT, FAAC, and CAME gate automation technology to design and install the very best systems. Automatic Gates – Swing Gates: Underground Gate Motors are mounted in a case flush to the ground. They are discreet offering good design aesthetics. Haritha Technologies can provide you with experienced advice on what gate motors are correct for your specific property. All motors are designed for quality and durability, so you know that when you purchase one of our products and have it installed that you’ll be making a great investment.We are the NO.1 suppliers of Automatic Gates in Hyderabad. Sliding Gate Motors get out of the way and if you have enough room to install one this option should be considered. The Motor drives a toothed rack on the Gate and you can have a track or go trackless. Sliding gates and the type of motor they require are different for every situation that they are installed in. You can have heavy sliding gates or light sliding gates, short ones or long ones, uphill or downhill. It’s so important that you install the correct motor with the correct sliding gate. Experts are the only ones who truly have the knowledge and experience you need to properly install sliding gates and automation.